While the Simple Collection’s Flax sweater carefully chronicles the basics of a top down sweater, the Antler cardi employs our other favorite construction: bottom up! The Antler Cardigan pattern is available here, get your pattern, your materials, and let’s get going! Before starting any sweater, but especially an adult sweater, you want to make sure you review our tutorial on gauge to ensure your sweater comes out to the dimensions you want, and learn about choosing your size to ensure you get a sweater that fits the way you want it to. Make sure you read the whole tutorial through before you start, so you can pick up our helpful hints! Antler is adorable on little boys and girls and grown up ladies too! Make a little size to learn the techniques, or jump off the deep end and get started on a sweater for yourself. Why start with the sleeves? The best reason to start with the sleeves is to get a gauge swatch without a gauge swatch. Just knit about 5 inches of sleeve and check your gauge and whether or not you are satisfied with the fabric. If you like it and you are on gauge, just keep going, if not you only have a bit of sleeve to rip out. 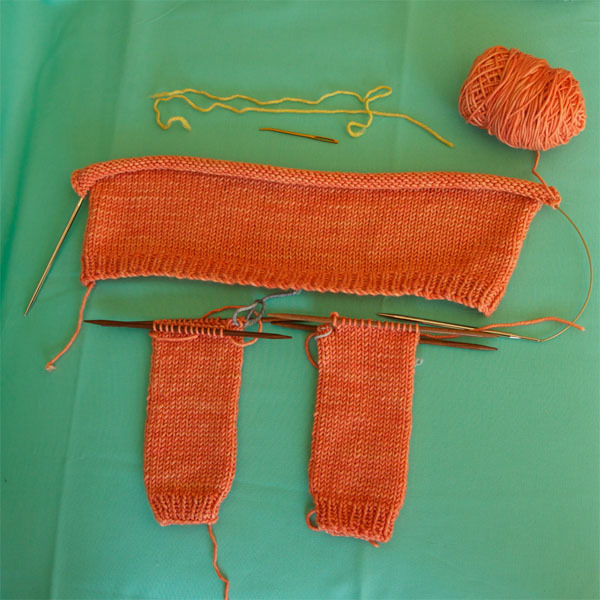 To knit the sleeves you will be casting on at the cuff and working to the underarm. You can use either double pointed needles (DPN’s) to start, or a long circular for magic loop. For casting on onto DPN’s you can check out our tutorial here, and for more information on knitting in the round on DPN’s look here. For magic loop look here. Distributing your stitches on DPN’s: I am a die hard DPN fan, but you can’t place a marker on the beginning or end of a needle. So instead I put about 1/2 of my stitches on the first needle, 1/4 on the second and third needles. This way I always know the beginning of my round starts at the beginning of the ‘big’ or ‘full’ needle. No markers required! 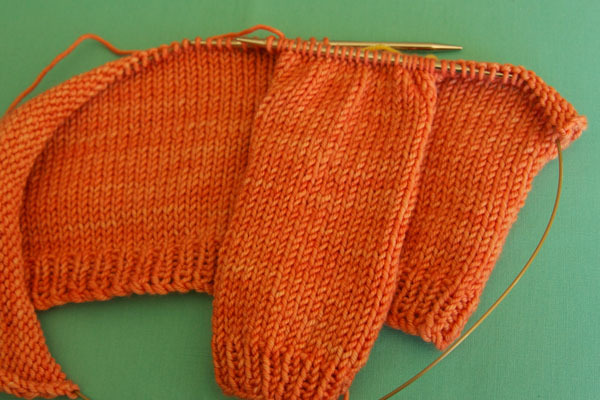 Once you have completed the ribbing, you will change to larger needles and start working your sleeve increases. 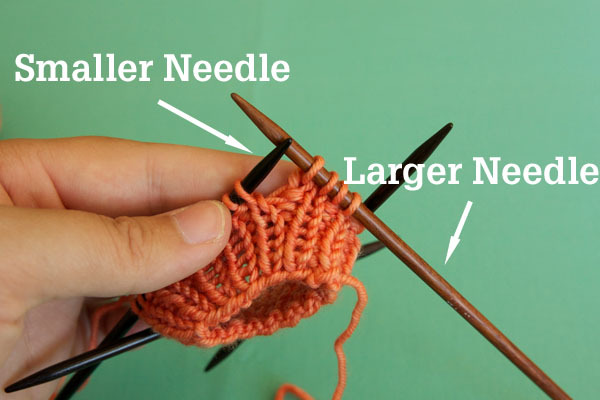 Changing to larger needles is simpler than it sounds, instead of continuing to work with your smaller needles, just start working with the larger ones. No need to move stitches, just start knitting. Sleeve Increases ::: You can certainly m1 (make 1) any which way you like but my favorite is the paired increase. Once the number of increases for your size have been worked, you will knit each round until your piece measures the specified length or the desired length to underarm. Measure twice! Next you will put your sleeve stitches on hold using waste yarn. You will be putting your underarm sts on hold on one piece of waste yarn, and the other half on hold with another piece (all will become clear later!). Helpful Hint ::: How to avoid ‘ladders’ – Ladders look kind of like runs in a stocking. They are loose stitches and gaps in the fabric that sometimes occur between the last stitch of one needle and the first stitch of the next. How can you avoid this? Simply make sure to give an extra tug to your yarn on the first stitch of a needle, this will make it extra tight and prevent ladders. 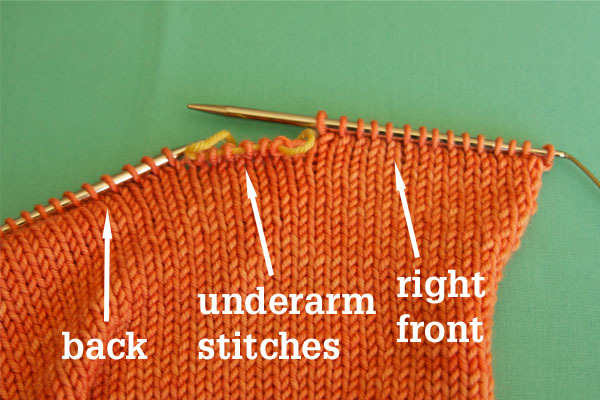 Making 2 the same ::: There is nothing worse than finishing a sweater and finding out your sleeves are not the same size, so make a few helpful notes along the way! 1. How many rows in your ribbing? 2. How many rows after you finish your increases? 3. Did I knit anything that was NOT according to pattern? Make a note! If you make these helpful notes you will have 2 identical sleeves just waiting for a body! This part is pretty easy peasy. Just cast on using smaller needles, working back and forth in ribbing pattern to specified length. Change to larger needles and work in stockinette (knit 1 row, purl 1 row) until piece measures the length specified for your size or the desired length from underarm, ending with a WS (wrong side or purl) row. All pieces are ready for joining. The arm sts (except the underarm) have been placed on double points so they are easy to join. Now for the fun part: Once you join the body and sleeves it will start to look like an actual sweater! You will be knitting across the right front, placing body stitches on hold for the underarm, knitting across the right sleeve, knitting across the back, knitting across the left sleeve, placing body stitches on hold for the underarm, and knitting across the left front. When joining you will be placing body sts on waste yarn for the underarm. Sleeves and body have been joined! 2 pieces of waste yarn, each with underarm stitches. One set from the body, one set from the sleeve. Work the specified number of rows in stockinette before proceeding to the cable portion of the yoke. Next Row: Knit decreasing ____ sts evenly spaced. This may seem like a complicated instruction but follow along and we will do a little math. What this means is that you have X sts and you need to decrease Y sts for a total of Z sts. So how are we going to do this? eg. For the Adult XS size this number is approximately 40. So you will decrease 1 stitch for every 40 stitches. Your decrease row will be: k38, k2tog. 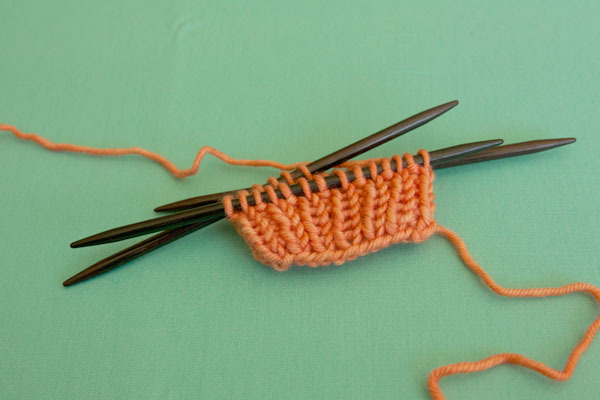 Because you need to decrease 5 sts for this size you will work that instruction 5 times and knit to the end. Although this may seem unnecessarily complicated (why don’t we just do the math for you?!) it’s an instruction you will come across often in sweater patterns. If we wrote out each size every time we had to do a decrease round like this our patterns would be 10 pages long! Time for cables! Each row has 2 edge stitches on either side and a number of cable repeats with the cables separated by 5 purl stitches. For instructions on how to cable, check out our tutorial here. On the RS (right side) rows you will be working the cable chart, on the WS (wrong side) rows you will be working your stitches as established. What does this mean? You will be ‘knitting your knits and purling your purls’. In other words, if you see a knit, knit it, if you see a purl, purl it. Repeat the cable pattern as many times as specified and proceed to decreases. The decreases are shown in the same manner as the cable section, but there are a few new symbols to note: purl 2 together, and the cable 4 back/front decreases. The decreases that are worked within the cable (c4bd and c4fd) are worked using a knit 2 together within the cable. Read the chart carefully and make sure you double check all of the symbols. Now you can switch to smaller needles and work in rib pattern for specified number of inches. Bind off. Button bands are picked up and worked last. You will be picking up about 4 stitches in every 5 rows. This means you will pick up 4 stitches, skip 1 row, pick up 4 sts, etc. and you will want to end up with an odd number of stitches in total. Tip: make a note of the number of sts picked up on the first button band. You will want to pick up that same number on the other side. Finishing a sweater can be the most important part. 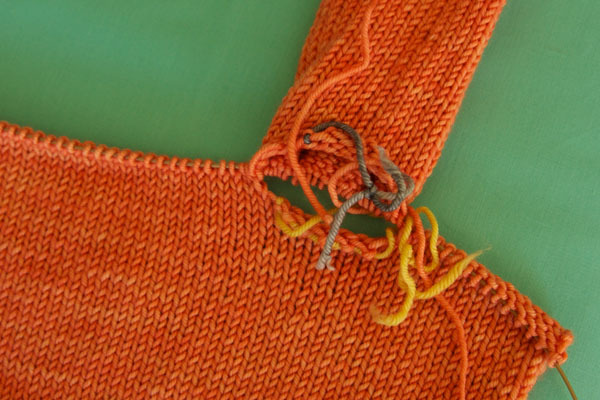 Block your sweater, seam your underarm sts using the kitchener stitch, and weave in your ends. There will be a small hole at either side of the seamed underarm, use your tail to sew that up. Sew on buttons corresponding to buttonholes. You have put a lot of work into your first sweater so don’t skip blocking, it’s an important step. Blocking will make your stitches even out and lie flat and generally ‘smooth out’ your work. It’s easy to block a sweater out of proportion if you aren’t careful. Make sure you have your measuring tape handy and that your chest measurements and length are as desired. Looking for more ‘how to’ tutorials? 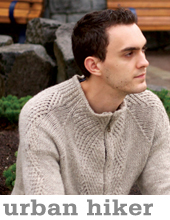 Check out The Simple Collection – our 100% free learn-to-knit series. The 8 fabulous free patterns sized from baby to big, and get started making modern seamless knits for the entire family! Like our work? Get our email updates and we will let you know about new patterns, tutorials, and events. We use length from underarm to hem in our patterns. Beyond the decisions we made pattern sizing, I can’t recommend ‘a good finished length’ for a 3-year old, as they vary SO widely. If you can ask the child’s parent to measure one of their commercial sweaters that fits (and measure from underarm down to hem) that might help. We always recommend to make kids a size above so that they can use the sweater for a year or more. This is fantastic, thank you! I’m making the 6-12 month size, and now that I am a good ways into the body, I see that accidentally cast on 80 stitches instead of 81. Can I make up for this by decreasing 1 less stitch later on, or will that mess up my yoke? Should I just pull it out and start over with the body, or is what I have salvageable? Thank you! Yep! One stitch is no problem, just toss an extra decrease in before the cables at the yoke. Thank you! Do you mean one less decrease? I cast on one too few stitches. Will it still work to decrease one less time? Again, thank you SO much! Yeah, just do one less decrease! Or an extra decrease and your ribbing will be 2 sts less than pattern (but will still work just fine). Enjoy! I am knitting my 2nd Antler Cardigan for my son, and I just found what I hope is not a catostrophic mistake. I cast on 93 stitches for the 2-4 year old size, but I increased the sleeves to 40 stitches which is actually for the next size. Can I just decrease 14 stitches evenly to set up for the cables to get myself back to the correct number for the size I’m knitting? I have 6 stitches on hold, not 8. I was thinking I could join the sleeves and knit the first round and then spread my decreases over the next two rounds and keep them close to the sleeves. I’m ok with the sleeves being roomier because the sleeves on the first sweater were a little too tight to layer easily. Hi Cheryl – You are decraesing at every purl ditch, taking the purl sts between the cables from 5 sts to 2. Does that help? Hi, Alexa! Thank you very much! Good afternoon! Forgive, your name? I very much had liked your cardigan. I want to connect such to my little girls, 2 years. You have in detail described all knitting, but it is no very clear to me how to tie sleeves to the main product. And there is an instruction in Russian? I will be very grateful to you. Hi Lyudmyla – Sorry, we don’t have a Russian translation for this one, but if you follow the pattern instructions stitch by stitch it will work! Great sweater. Almost finished. Can you tell me how to calculate 5 button band for 1-2 size? How many rows between buttons? The button hole sounds complicated. Is there an easier way? Do I wash the sweater in a sweater wash or just steam it? I am worthy sleeves. Third size. I cast on 32 stitches and work increase row plus 5 rounds twice. Each increase row has 2 in erases. So that would be 4 increases total which would be 36 stitches. The instructions say I should have 34 stitches. Not 36. Thank you. Hi Ann – it says to repeat those 6 rounds until you have 34 sts, so you only work them once. 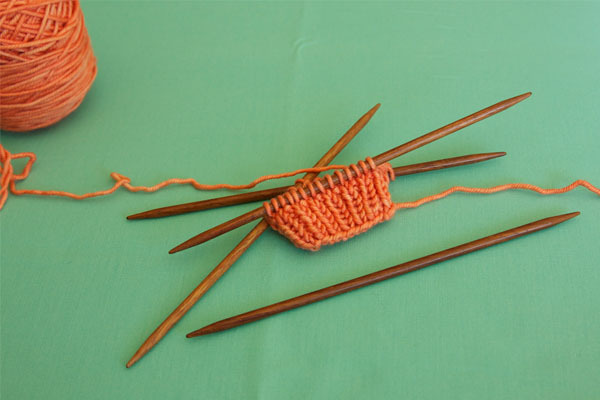 When joining body and arms in preparation for knitting the yoke, the instructions say (I’ll use smallest size for example): Knit 15 body stitches (right front). Put next 6 body stitches on hold (right underarm.) Knit 24 held stitches from right sleeve 9 (all except underarm stitches.) Knit next 37 stitches from body (back.) Put next 6 body stitches on hold (left underarm.) Knit held stitches from left sleeve as right. Knit remaining body stitches. So, there are stitches held from the right edge of the right front body piece, and from the left edge of the back body piece. This seems asymmetrical. Can you address this? Do you have a video for joining the sleeves? I need to see it understand. 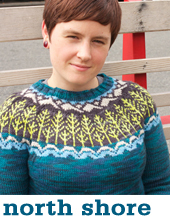 I have the Pacific Knits book and plan on making both the Antler Cardigan and the North Shore pullover. This is my question…would it be possible to turn the antler sweater into a pullover also? My purling is never the same tension as my knitting – consequently, I love knitting in the round! I might be able to figure it out on my own, but would love any tips! Btw- your instructions are so easy to follow! I’ve knitted the flax pullover twice! You absolutely can! It’s been kind of a common request lately. The only thing to remember is at the start of the yoke you want a number that is divisible by 21 (16 antler sts and 5 purls sts) and you don’t need any edge sts. Once you have completed the decreases, before the ribbing, just check to make sure your neck isn’t too wide for a pullover. If it is just work 1 round decreasing to the number you want for the ribbing. The only other consideration is where the cables will fall, for example, do you want a cable directly in the middle of your yoke, or would you prefer not. Thank you so much for this tutorial. I just cast on the o-6month size and needed a visual for the sleeve portion. I’m working on the Old Growth sweater, and I attached the sleeves, but after working in stockinette for a few rounds, I noticed that the sleeve section is reverse stockinette :( Obviously this isn’t correct, but will it cause me to be unable to Kitchener the underarm at the end? Do I need to go back and try again on attaching the sleeves? Or can I keep going, using that reverse stockinette as a “design element” and have the underarms work out okay in the end? I meant “for a few rows,” not rounds. Hi Wendy – hard to say without a picture. You can still graft the underarm, even if the sleeve is in reverse stockinette. Was the sleeve inside out when you attached it? The sleeves aren’t inside out, just the yoke where I attached the sleeves. And not the whole yoke, just the sections where the actual sleeves are. I don’t know what happened lol. If a picture would still be more helpful, I can definitely send one over (is email okay?) later today. Is it possible to work/add/??? a shawl collar to the sweater without having to possibly rewrite the pattern? I’m invisioning a Cowichan-esque sweater. I think you would need to make it a v-neck in order to add the shawl collar, so I’m afraid that’s a bit of re-write. It would also cover a lot of the cables. I like to knit in the round. Can this sweater be worked in the round and then steeked? 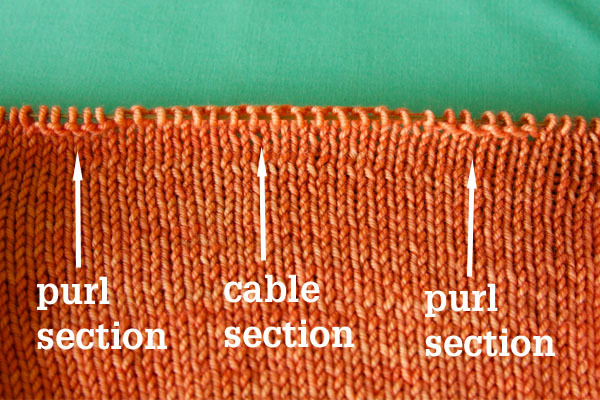 If working in the round with steeking in mind—After decreasing the yoke to set up for cables, would you include the “Purl 1 Row” part, or move on to the Cable Set Up row? I would like to make this sweater as a pullover. 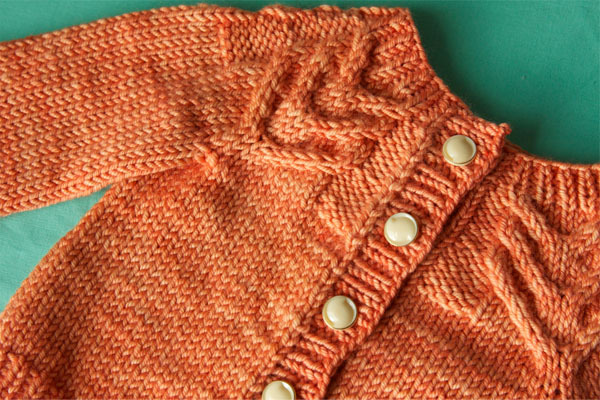 Have you figured out how to adapt the pattern to a pullover? 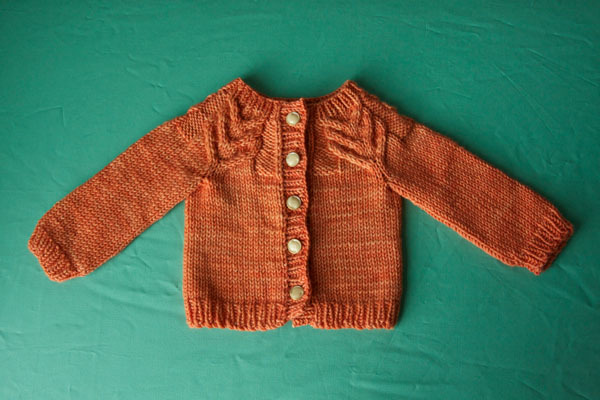 Hi – you would want to add a few stitches at the fronts to compensate for the button band. Then, after the join at the yoke you would want to decrease to a number divisible by 21 (5 purl stitches and 16 antler stitches). You would work the chart in the round, which means on even numbered rounds you would knit the knits and purl the purls. I’m going to try to knit the chest size 35 but I have one problem my granddaughter plays college basketball and her back is wider from playing sports all of her life. So what do you think of the size 39 or is there something closer to the 35 that I can do? Also I love your tutorials. I knit the women size M and it shows 39″. When you block it you block 39″ or 38″ since the pattern states 1″ negative ir positive.? Since it is not for me I can’t try it on. Could it be that there’s a mistake in the pattern? I am doing the sleeves of the antler cardigan and for the size 6-12months it says that I should begin with 30st and then increase until I have 32 st. But thats already after one set of increases, so it doesnt sound correct. Shouldnt it be 42 st? Hi Lotte – nope, 32 is correct, babies arms don’t change like grown ups. So if I just ignore row 5 and move on, as you suggested to Christine, do I k or p any of these spaces? How do I account for the stitches? I am having a terrible time with the c4bdec in the Antler hat I am knitting, and I am sure I must be slipping the stitches onto my cable needle wrong or something. It is the hardest stitch I have ever tried I think, and is when I try to knit 2 tog from the cable needle. Can you help me with this? Take it slowly would be my first suggestion. And perhaps practice this a few times on a sample swatch? The second suggestion (this is what I do), is instead of working the stitches directly off the cable needle, slip them BACK onto the left-hand needle, then work them off of that needle. I find this less fiddly. Good luck! It will become easier with practice. I was hoping to copy/paste everything into my Word so I could make smaller photos to print less pages. But the pictures don’t copy. Is there a way for me to do that for personal use only? 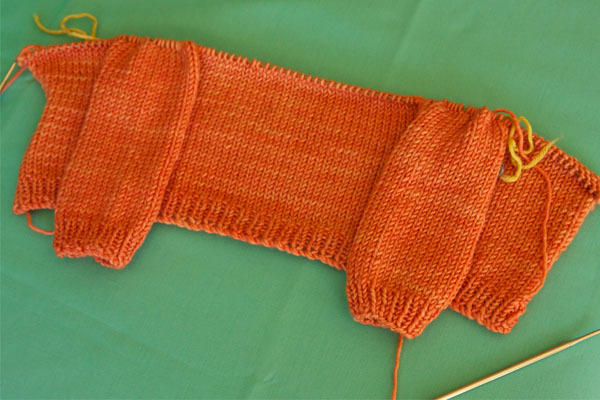 The reminder about knitting a sleeve first makes perfect sense – and as a swatch! When taking a class for a entrelac long cardi, the teacher had us make one of the pockets first – that was our swatch. Thank you! Wonderful aka wonder-filled website. Forgive my stupid question. I am stuck on the 5th row of chart B- decreases. what do I do on the “No Stitch” ? Just ignore that box and move onto the next one. Thanks for asking this, Marny CA. I am stumped at row 5 decreases right now. I wish that the “written” directions would be written out completely. I will give it another try. I just finish an Antler for my granddaughter and I’m going to cast one on for my grandson. I love the sweater and the pattern is written beautifully. I’m teaching a young friend how to knit and the tutorial would be a great help to her. Thank you for your beautiful patterns. Love them. This is an awesome way to show how the bottom up pullover is done, & I love how you showed the step-by-step process especially for those sections which can be confusing like joining sleeves to body!! This is a fantastic tutorial! Can you tell us which yarn you used? Project/Gift Knitting Lineup | SSK AND CO.